95 pp, 6" x 9"
I was first introduced to Wallace Stevens' poetry in 1961 when I was a senior at Ann Arbor (Michigan) High School. At that time, only 6 years after Stevens' death, his poems had not made it into the textbook used in our Advanced-Placement English class, but our teacher Dr. Frank Reed (a former University of Michigan faculty member) was determined that his students be current on modern poetry. So, in addition to walking us through Perrine's Sound and Sense, Dr. Reed also gave us hand-outs ("dittos" in those days) of other poems, such as Stevens' The Snow Man and The Emperor of Ice Cream, and discussed them with us, line by line, word by word. That class and those poems were a turning point in my life. I had only recently started writing poems myself, and while I loved the poetry I had read in previous classes, Stevens was something entirely new. His poems revealed that the creative horizons of the modern English language were much wider than I realized. In Ann Arbor, my family lived in a large house a mile from the high school, and I walked to school every day, rain, snow, or shine. I also composed poems while I walked. Our home overlooked West Park, a 20+ acre, wild, hilly place, a green bowl of rolling meadows ringed with fairly steep slopes forested with oaks, hickories, and maples that turned vivid colors each fall. I loved West Park. It was a haven whenever I needed a break from the everyday. Morning, noon, or twilight, in any weather or season, the park was receptive, transporting me into the freedom of the natural world. It would be decades before I learned that Wallace Stevens, the poet I was so dazzled with during those years, also loved walking in all seasons, in Hartford's Elizabeth Park, as an escape into what he called "my green, my fluent mundo." How that phrase resonated with me – and still does. I have since learned that Stevens' life and mine overlapped curiously in other ways. Not only were we both dedicated walkers and devotees of a favorite park, but we also preferred the warmth of the south over the cold north. Moreover, we each had a personal history in which a male family member was responsible for a significant, negative departure in our lives. For Stevens, this consisted of a double tragedy. First, his father demanded that instead of pursuing a life as a scholar and writer, Stevens should follow his father's lead and go into business. Then, the father rejected his son's choice of a bride (Elsie Kachel), refusing even to attend their wedding, and thus causing a family rift that lasted until the father's death. The forced departure for me occurred when my father's oldest brother showed up one day in the warm hill country of Austin TX (where I had been born nine years earlier) and essentially kidnapped our family, dragging us north, straight into the depths of a hard Michigan winter. It took me 13 years – the rest of my childhood, adolescence, and young-adulthood – to escape from there (with the help of my husband-to-be) and return to the south, which my heart and soul told me was where I belonged. Stevens never entirely escaped from following in his lawyer-father's footsteps. However, he did learn to lead an active, parallel life as a poet and connoisseur of the arts, although sadly enough, the father's curse on his marriage proved only too prescient, as over the years, Stevens watched the girl whom he loved in his youth slowly transform into a cool, distant wife-in-name-only as opposed to the loving, intellectual companion he needed. And though he took occasional trips to Florida, making it as far as Havana a number of times, he never got to live in the warm south. His poetry and letters are filled with the overwhelming longing for warmer climes. As I read Stevens' poetry and letters over the years, I came to understand that I was much more fortunate than he, that fate has granted me invaluable gifts denied to him – first, living most of my years south of 35 degrees latitude (in Arizona, Oklahoma, Texas), freed from the lands of winter; and second, the daily blessing of a loving, intellectually stimulating marriage (50 years and counting) – in which one of our favorite pastimes is the writing and reading of poetry. This book, then, is a tribute to Stevens' memory and to his singular accomplishment in poetry. It is an attempt to make an affectionate, human connection with a man deprived of some of life's most basic pleasures – living where you want, living with whom you want, and having the psychological and emotional freedom to express yourself and evade the fetters of our Puritanical society. The method behind this tribute comes from my work as both a photographer and poet – combining pictures of the natural world with a series of poems designed as what musicians would call variations, where one composer creates works that draw on and develop features from another composer, such as melodic themes or other aspects of musical style. The goal in such music is two-fold: to pay tribute to the original, and at the same time to make something new. Thus the poems here, while never attempting to fully replicate Stevens' poetry, still draw on the manner, vocabulary, and poetic devices found throughout his work. My husband (who has also written a book of poems about Wallace Stevens – see the bibliography at the end of the Notes) says I am "ventriloquizing" Stevens – and the process has felt very much like that, or perhaps like being a medium, letting another voice speak through me. The two poems in the first section, Beginnings: Young Stevens, hark back to Stevens' early days – first, as a young man in Pennsylvania (where I use a poetic manner that is more like Stevens' beloved Keats that his own mature style), followed by a poem designed to express his attitude about ending up in Hartford CT. The rest of the book goes on to follow him as he walks there, through the seasons, in all weathers, traversing the emotional and geographical distance between work and home, finding solace over and over again in the scenes of Elizabeth Park. 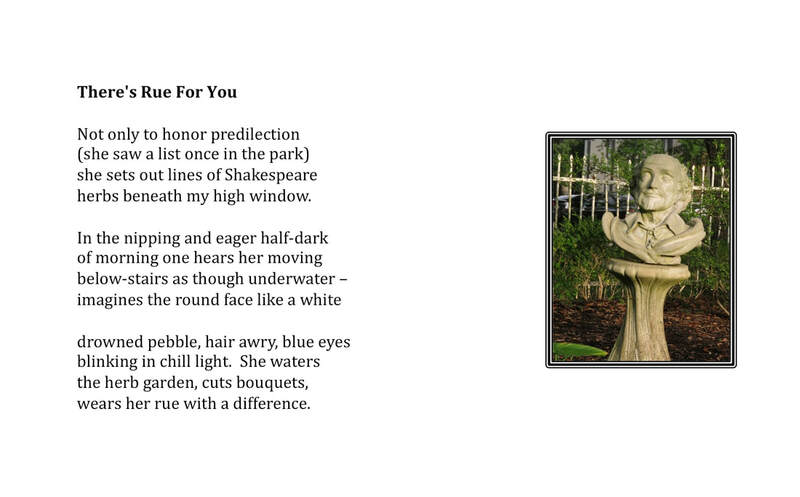 As you read these poems and view the photographs, I hope you hear my faux-Stevens, as he walks again in his beloved park, thinking and speaking, sometimes sadly, sometimes happily, telling us more about what he felt and loved and longed for than he was free to do in his own massively powerful but often cryptic poetry. For those not familiar with the details of Stevens' life and work, the Notes at the back of the book offer guidance concerning biographical references, topics, and quotations from his poetry and letters. to run, a place to be free. Down came rain, I splashed in silver. Down came sun, I swished through green. Down came leaves, I rustled in crimson. Down came snow, I pushed through white. woke, it would be there, again.